You Know How You Feel About Nike… Have You Ever Thought of Why? Have you ever been to a Super Bowl party or been in a bar when rival teams are squaring off? Have you ever been to Boston and worn Yankee apparel? I strongly suggest you don’t do the latter if you’re not secure with yourself. Part of America’s charming culture is its indelible connection to athletics and the passion people have when partaking. Journalist Kim Ann Zimmerman wrote, “The United States is a sports-minded country… football has eclipsed the poll in America’s favorite pastime.” Being such an essential part to so many people’s lives, athletics can enact certain social psychological behavior without the mass majority realizing. Recently there has been uproar, both positive and negative, about the Colin Kaepernick Nike ad. Colin Kaepernick was stripped of his football career after protesting police violence on black Americans by kneeling during the national anthem. Across America millions took offense and started protesting the NFL for “allowing” him to do that. It ended in the NFL enforcing their players stand, Colin Kaepernick getting fired from the 49ers, and no other team extending an offer. Since then, the issue had mostly been quiet until Nike hired Kaepernick to be the face of their new television ad. Fundamental Attribution Error is common place in society. We attribute characteristics to something based off of our perspective on the subject without factoring in the past or situational circumstance. 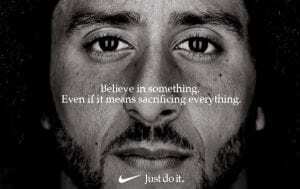 This situation with Nike has newly awoken both the people who were angered at the kneeling and those who supported him. Enraged people are attributing characteristics to the Nike brand that aren’t necessarily there making them act in ways of dissent. At first, this made Nike’s stock drop a bit until people who supported the movement went out and started buying. As more people dissented the ad, more videos of sneaker burning and Nike cursing were posted. Protesters against Nike were cutting the checks off of their socks, burning their sneakers, and posting things on line degrading the brand of Nike because they attributed ignorance and disloyalty that went against their morals to the brand. They are fundamentally attributing ignorance and unpatriotic behavior to the Nike Brand. It is evident their use of fundamental attribution error when they say how Nike is choosing Colin Kaepernick’s “side” and disrespecting America. The dissenters “stand with their country” unlike the brand of Nike who is “forcing them to choose between their favorite brand and their country”. They are attributing what themselves and other people who agree with them as moral people and true Americans. The people who dissent attribute disloyalty and hatred for our country to the brand of Nike and act according to their rage due to this attribution. It is more comfortable for people to attribute something to a person’s trait rather than their situational influences because that means we could possibly act in such a way. (Dr. Joel Frederickson and Zachariah Berry, 2015, p.47). Their identity as unproblematic patriot may be challenged which can cause severe anxiety they would rather avoid. Jimmy Kimmel even had a skit dedicated to it on his talk show where he reenacted actual angered peoples. Doctoral student Zachariah Berry and Dr. Joel Frederickson from Bethel University wrote an article to explain this fundamental attribution error. The write about and discuss the explanations for its place in society and the implications it can have. One explanation is people comfortability with categorizing and separating from themselves because they would feel anxiety if they think about it situationally. What struck me as particularly interesting was an implication in their report of fundamental attribution error affecting moral development and judgement. Berry explains, “We tend to rely first on our intuitions when making a judgment of a situation… information received regarding an event, however, may be corrupt when committing the FAE. In situations where the behavior observed requires a moral judgment, committing the FAE may cause us to form moral judgments using inaccurate information…” (p.52-53). This is exactly what is going on in most cases with the Kaepernick backlash. Certain citizens feel Nike is against their morals and acting in unfavorable behavior based on inaccurate information therefore leading to the fundamental attribution that Nike hates America and believes you shouldn’t stand when hearing the national anthem. The ability to fundamentally attribute characteristics incorrectly is available in all human beings. According to Berry, this is the innate way people make judgements. We want to automatically categorize which leads to insufficient reasoning. Is Nike an America hating, flag burning company? Most likely, not. Their message was “Believe in something. 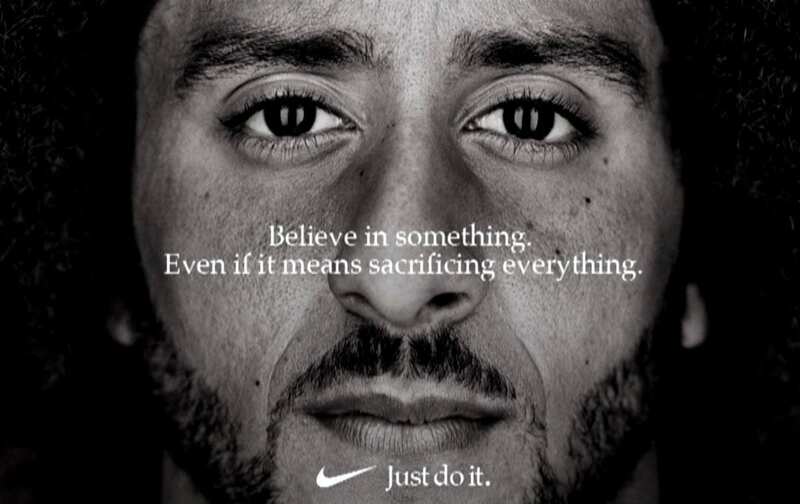 Even if it means sacrificing everything.” Nike always serves to inspire through athletics in all of their “Just Do It” ad campaigns. In 2002, Nike won an Emmy for their ad that year showcasing amateur and professional athletes in a moving video with gracious and beautiful motions that would bring tears to any sport participator’s eyes. The brand is about inspiration, not hatred for America. · Dr. Joel Frederickson and Zachariah Berry. “Explanations and Implications of the Fundamental Attribution Error: A Review and Proposal.” Journal of Integrated Social Sciences, vol. 5, no. 1, 2015, pp. 44–57. Next Next post: A Splash In The Water: Accident Or Murder?